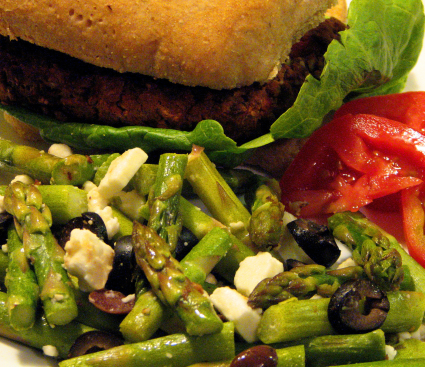 Asparagus is said to have spread to the tables of Ancient Rome from Asia. Other sources say it has no known origin and that it was probably spread by birds, growing best where the earth froze. Asparagus has been popular in England since the middle of the eighteenth century, where it was known as sparrow-grass to street sellers. Asparagus comes in three colors: green, white and purple. 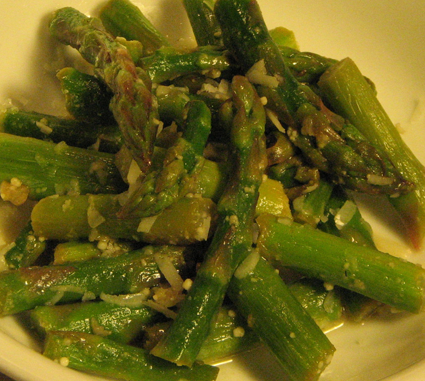 It is high in protein and vitamins A and C.
To cook asparagus, cut or snap off the tough bottoms of the stalks. Remove any scales and wash the stalks well. Tie in a bunch and stand upright in a tall pot in one or two inches of water. Bring the water to a boil and cover, leaving an opening in the lid. Cook for 15 to 20 minutes, taking care not to overcook. Use cooked asparagus as soon as possible. Fresher is always better. If necessary, store in a refrigerator in a plastic bag for no more than two days. Although each of these recipes use asparagus, you can substitute other vegetable such as beans, brocoli, carrots, cauliflower, peas, or zucchini. 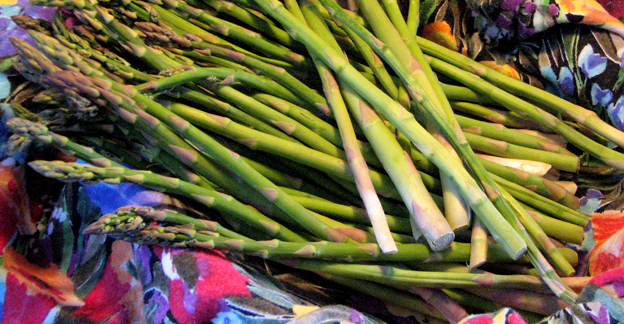 Trim off tough stems and cut the asparagus in extreme diagonals. Steam over boiling water for 3 minutes. Heat 1 tablespoon of oil in a pan and sauté for 2 minutes with grated onion. Mix with 1 tablespoon of teriyaki sauce. Clean and trim the asparagus. Cut into 2 inch pieces. Place in a pan with the water oil and garlic. Bring the water to a boil and cover tightly. Cook over medium heat for 8 minutes. Remove cover and raise the heat to high. Stir gently until the water is completely evaporated and the asparagus is cooking in the oil. Remove from heat add lemon juice, salt and pepper to taste. Sprinkle with parmesan cheese. Serves 4. Cut asparagus into pieces and steam for 10 minutes. 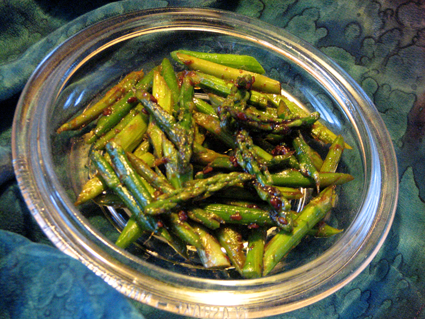 Heat the oil in a fry pan and sauté the asparagus until tender. Sprinkle the rest of the ingredients over the asparagus and toss to mix. Remove from heat when everything is heated through. Makes 3-4 small or 2 generous servings. Steam the asparagus for 10 minutes. Meanwhile, mix the orange juice and cornstarch in a medium sauce pan until smooth. Heat over medium heat stirring constantly until thickened. Remove from heat and stir in yogurt and orange pieces. 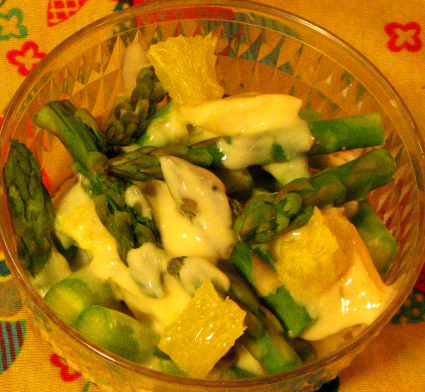 When the asparagus is tender mix with the sauce and serve. About 4 servings. Clean the asparagus and cut into 1 inch pieces. Steam for 10 minutes. Meanwhile, heat oil in a medium pan over medium heat. Saute onion for 2 minutes until limp and translucent. Add the potatoes and cook for one minute. Add the vodka and cook for one minute. 1 cup of mashed potatoes can be substituted for the cooked potatoes. These should be added after the vodka instead of before. Remove the pan from the heat. 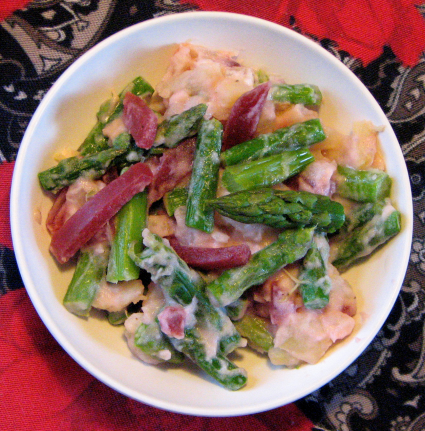 Stir in the asparagus, sour cream, and season to taste. You can use canned or pickled beets. Serves four. This has the flavors of borsch. The vodka is not usually added to borsch, but it does add a little something extra. This can be made ahead and eaten cold or reheated gently in a double boiler or steamer. Makes a lovely colorful dish for an Easter feast, garnished with chopped hard boiled eggs.